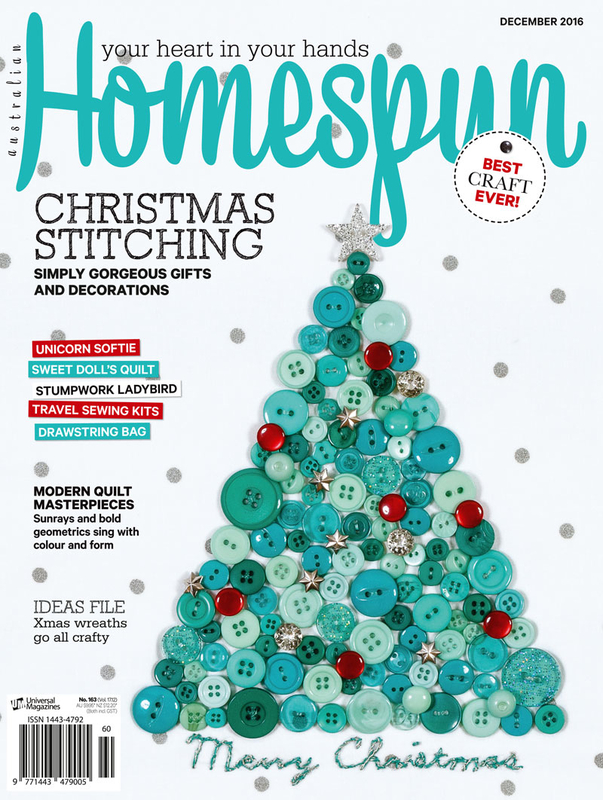 So excited to share that my sewing notions wreath has been published in the December 2016 issue of Homespun magazine. This was such a fun project created completely out of thrifted, vintage sewing notions. I originally made this wreath in honor of my mother who taught me to sew. 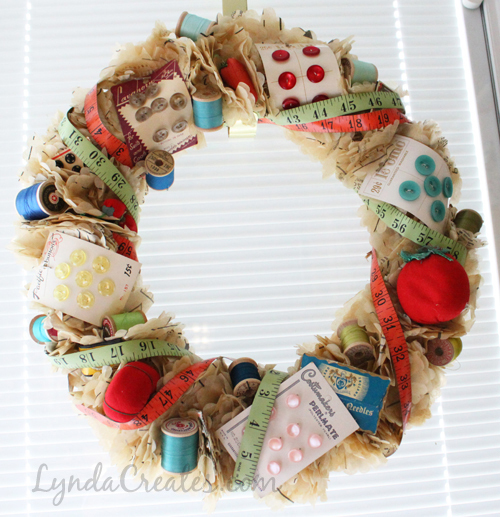 On this wreath are vintage button cards, spools, tomato pin cushions, strawberry needle cleaners, snaps, sewing needle cards and two measuring tapes. 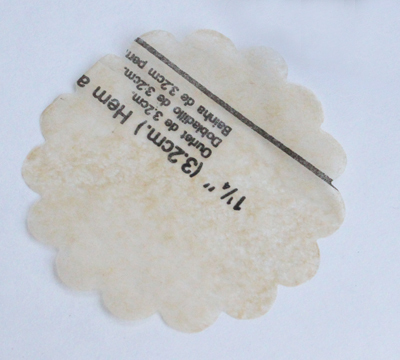 Begin by laying several layers of pattern tissue flat and die cut using the Sizzix Circles, Scallop die. If you don’t have a die cutting system you can trace 3 inch diameter circles using a large cup then cutting out the circles. The circles do not have to be perfect. 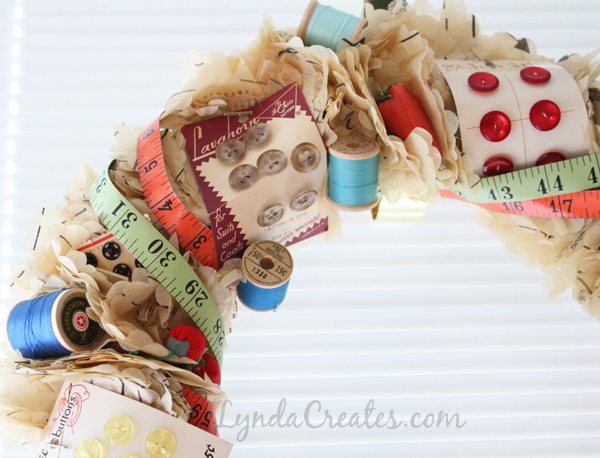 Using straight pins, attach individual tissue circles to the wreath form. Pack them in fairly tightly so that the finished wreath will look full. 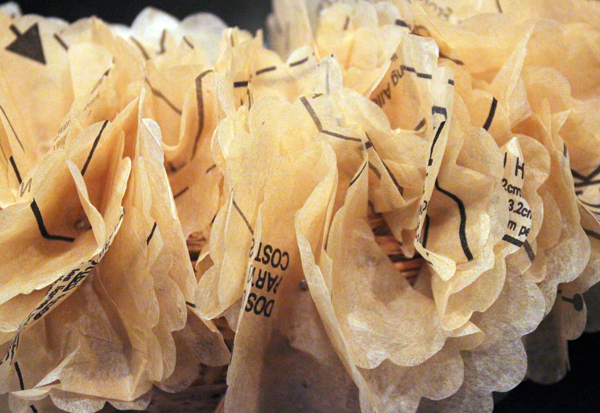 Scrunch the tissue circles as you go to create more fullness. Fill any gaps where you can still see the wreath form beneath. Your wreath should look something like this. 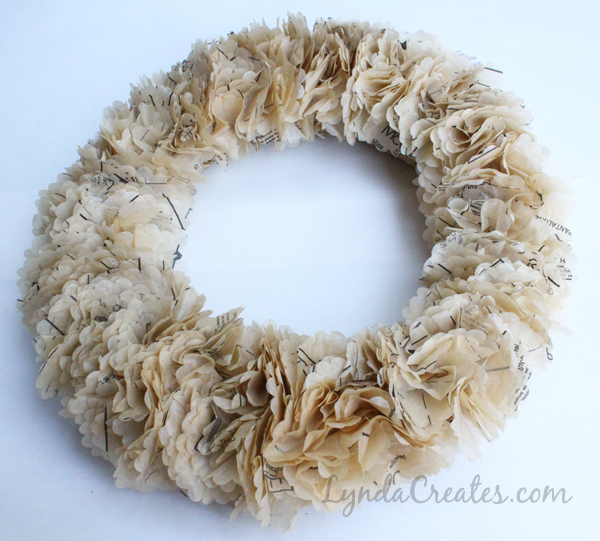 I used about 1 1/2 sewing patterns to create enough scallop circles to cover this wreath. Once the basic wreath is created then you can decorate it any way you like. 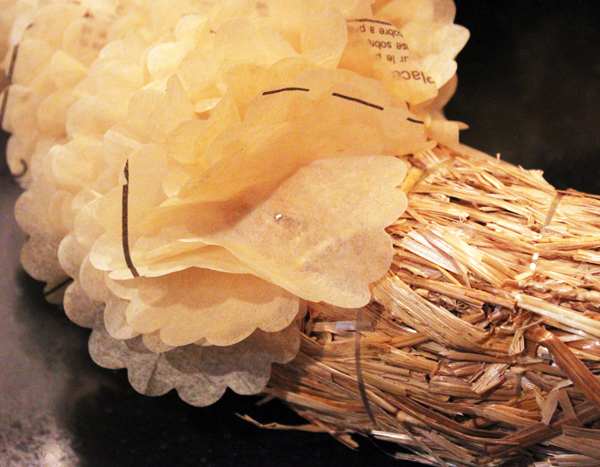 I used hot glue to secure the notions to the wreath or you can use pins if you want to protect the vintage items. 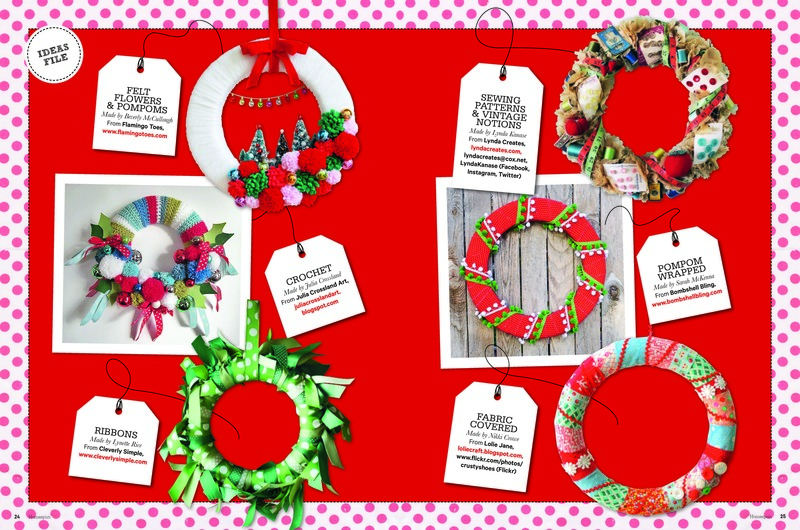 Below is the magazine cover and the inset shot of my wreath in the top right corner of the spread. I love seeing the other inspiring ideas in this magazine. Hope you enjoyed this easy project and please leave a comment. Enjoy! 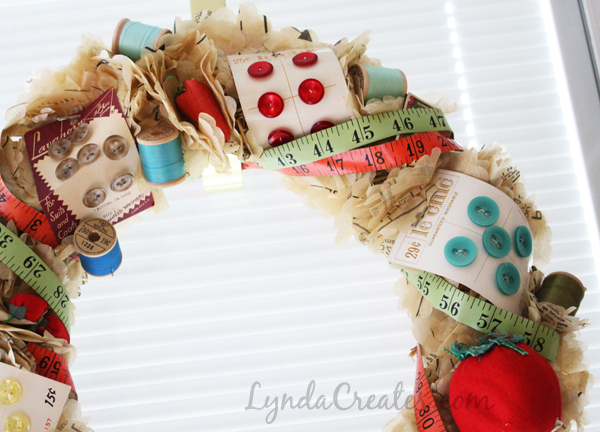 Such out of the box thinking on this pretty wreath! Hi Mary. Thank you so much for the kind comment. So glad you enjoy this wreath. Thanks for visiting. Thank you so much for the wonderful comment. I just came by and linked up to Practical-Mom.com. Thanks for the invite. Really beautiful! All details are amazing! You got yourself longlasting memory piece. 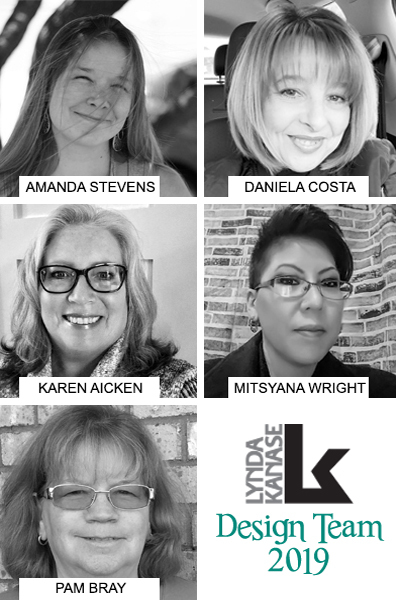 Congratulations on your feature! Thank you so much for the wonderful comment. I am so glad you love the wreath. It truly has wonderful memories for me. Thanks for visiting. How big are the scallop circles? Love the idea and think I would like to tackle it. Hi Diana. I just measured the scalloped circles and mine are approximately 2 1/2″ across but the circle could vary between 2″ to 3″ and still work well. Hope you have fun creating your own wreath. Thanks for commenting. This is so cute and ingenius! 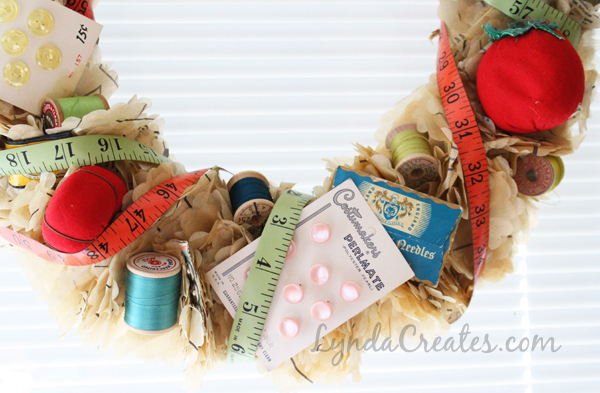 This wreath would make a great wreath for any seamstress or crafter to hang in their crafting room or even a spare bedroom FOREVER! I would hope they wouldn’t be tempted to take it apart and use the pieces for a project, but hey, it would be their gift to do as they wish. The wreath would be pretty awesome just with the pattern circles and a ribbon bow! Just lovely. Hi Barbara. Thank you for the great comment and the clever suggestions. 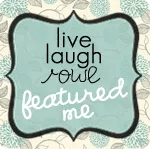 This wreath was so much fun to make and would be a wonderful gift to share. Thank you for visiting. Your wreath is so beautiful and creative! What a fabulous idea of how I can display some of my vintage notions. Can’t wait to create my own wreath. Thanks for sharing. Hi Lana! Thank you so much for the wonderful comment. Hope you have fun using and displaying your vintage notions. Thank you for visiting! Hello! Thank you so much for the wonderful comment. So glad that you like the sewing wreath. Thanks for visiting!